Can't book medical appointments because of unpredictable shifts? Can't book leave because your boss doesn't like you? The reality of modern work doesn’t have to be this way. The world of work is getting tougher for almost everyone, but younger workers are having a particularly bad time. And many young workers don’t even know how badly they’re being screwed over – they’re just grateful to have a job. This week it’s the TUC’s our annual Heart Unions Week, and part of our activity is focused on supporting young workers. From care workers who don’t get paid for all the hours they work, to retail workers who get abuse from customers and no support from management – young workers all deserve better. Many young workers will rush to cover a shift they were only get told about on the day - but never get any flexibility back when their childcare falls through. And all too often, they don’t get decent training and can’t see a way forward to a better job. When we spoke to young workers, it was no surprise how many were worried about interpersonal issues like rude and abusive customers or clients, or managers playing favourites. Lots were worried that there are few opportunities or support to get ahead. And of course, many were worried about how to cope with low pay and unpredictable hours. We heard some real horror stories too. Like the man working in retail who rarely gets any leave approved because the manager doesn’t like him. We heard from workers who get no training to do their jobs and have to “pick it up” from colleagues. And we talked to a woman who can’t go to the dentist because she never knows her shifts far enough in advance. These stories weren’t isolated examples – and they show just why young workers need unions. We know that when workers come together in a union, they can change their workplace for the better – helping stop unfair treatment, campaigning for equality, and pushing for better pay and decent conditions. Unions are also a great way to get ahead - helping more than 250,000 people each year to get the learning and training opportunities they need to get on in life. 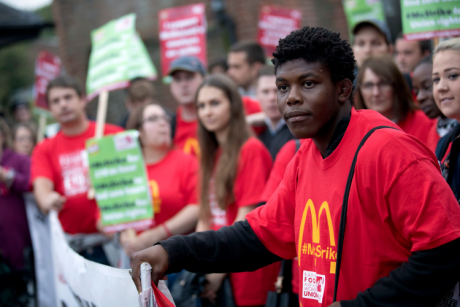 The first McDonald’s strike in UK history is an inspiring example of younger workers taking action in a historically non-unionised sector. Their main demands are for £10 an hour for all workers, fair contracts and for their union to be recognised. It’s the last demand that could unlock further gains in the future and begin to redress the power imbalance between the company and the staff. Yet less than one in ten young workers in the private sector have the support of a union to deal with all the problems they face. We know that unions have to change to make sure that we’re in touch with young workers and on top of what matters to them. That’s why the TUC is leading a programme to ensure unions adapt to the new context – and why we’ve been out there listening to young workers. This HeartUnions week, the union movement is celebrating workers standing together all over the country. Why not take the opportunity this week to get together with some co-workers and join a union. Or if you’re already a member, ask a friend, neighbour or colleague to join as well. We’re stronger together.